Complete the transformation of your roof by investing in the Klober Permo-Forte Breathable Felt, brought to you by JJ Roofing – the number one choice for roofing supplies. Here at JJ Roofing, we are passionate about delivering quality products, and we’re confident that the Klober Permo Forte will be everything you’re looking for – and more! The Klober Permo-Forte Breathable Felt is an innovative system that will keep your property warm and dry all year round. Consisting of a strong four-layered system, the Klober Permo Forte guarantees unbeatable performance and durability and will provide you with many years of reliable service. This outstanding durability is because of the ultra-tough polypropylene material that makes up the outer layers. The inner layer features a microporous polyethylene film and re-enforcement mesh. Once in place, the Klober Permo Forte felt is secured using double integral tape. This tape is both strong and durable and will ensure that your roof is airtight, thereby, reducing energy loss. Even better, once fitted, this roofing felt will ensure that your roof remains weathertight while allowing the structure to breathe. Obviously, the most important aspect of any roof is its ability to repel both rain and snow. With the Klober Permo-Forte Breathable Felt, you won’t be bothered by a property that is damp and cold. Each of these products has been double hydrophobic treated and is BBA, IAB and CE certified so you can be confident that your property will remain waterproof. Furthermore, this product serves as a robust vapour permeable underlay that actually helps to reduce the risk of condensation forming. What this means is that when you install the Klober Permo Forte felt on your roof, you won’t need to rely on added ventilation to keep your roof space free from condensation. 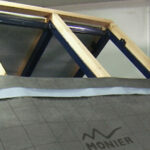 As such, this product is used in many different cold and warm roof applications. Other key features include exceptional UV-resistance that will keep the product UV stable for up to four months even while subject to direct exposure. Plus, this type LR underlay boasts superior nail tear strength which won’t let you down. At JJ Roofing, we supply the Klober Permo-Forte Breathable Felt in roll sizes of 1.5m x 50m – so if you’re looking for a way to limit the air leakage in a sealed roof application, this is definitely the product for you!